PITTSBURGH—The University of Pittsburgh has received a generous and substantial gift from alumnus John Petersen and his wife Gertrude for the construction of the Panthers’ new Olympic Sports Complex. The facility, to be named the Petersen Sports Complex, is being built on 12 acres at the peak of Pitt’s upper campus, and will provide state-of-the-art homes for the Panthers’ baseball, softball and men’s and women’s soccer teams. 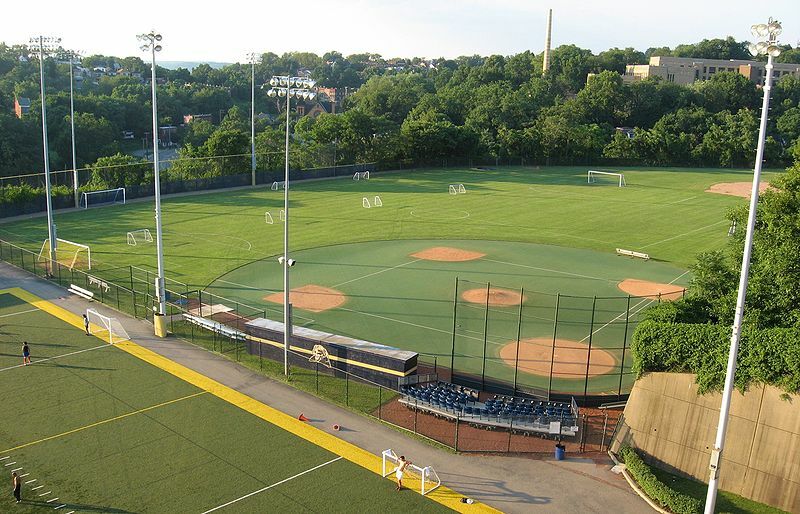 The Petersen Sports Complex will not only give Pitt student-athletes nationally competitive facilities, but it also will rejuvenate a previously untapped area of land that neighbors the University of Pittsburgh campus. The Petersen’s generosity helped make a reality the Petersen Events Center, which has dramatically enhanced student life on campus since its completion in 2002. Widely hailed as one of the finest college basketball arenas in the country, the Petersen Events Center has also greatly impacted Pitt students by providing them with outstanding recreation and fitness facilities and a fitting home for the University’s annual graduation ceremonies. Additionally, a significant gift from the Petersens in 2006 created an endowment supporting research in nanoscale science and technology at Pitt’s Institute of NanoScience and Engineering, now named the Gertrude E. and John M. Petersen Institute of NanoScience and Engineering. Baseball Stadium: will include hitting and pitching practice areas, team dugouts and a press box. Synthetic grass will allow the Panthers to play and practice throughout the year, while lighting will allow for evening games. Softball Stadium: will have a skinned infield with an artificial grass outfield, as well as hitting and pitching practice areas. The stadium will have lighting, team dugouts and a press box. Soccer Stadium: will be a practice and competition venue, complete with a synthetic grass field, lighting and a press box. 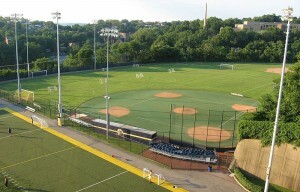 Completion of the facility is expected for spring 2011. A 1951 graduate of Pitt with a bachelor’s degree in business administration, Petersen is the retired president and chief executive officer of the Erie Insurance Group, located in Erie, Pa. While an undergraduate at Pitt, he lived on campus and lettered as a member of the swimming and diving team. The Petersens have long maintained a strong relationship with the University, supporting scholarships and other activities in the College of Business Administration and the Pitt Athletic Department. Petersen served 33 years with Erie Insurance Group, one of the country’s largest property/casualty insurance groups, before his retirement in 1995. He joined the company as an accountant in 1962 and became Erie Insurance’s first investment officer. His investment skills helped the company’s property/casualty assets grow from $20 million in 1962 to more than $4.6 billion at his retirement. Before joining Erie Insurance Group, Petersen served as an accountant with the General Electric Company for 11 years in Fairfield, Conn.
“The extraordinary support that Pitt has received from John and Gertrude Petersen has played a critical role in elevating our University on many important fronts,” University of Pittsburgh Chancellor Mark A. Nordenberg said. “The Petersen Events Center provided the foundation for the rise to national prominence of our men’s and women’s basketball teams, gave us a spectacular on-campus site for commencement and other important programs, created a new center of student life, and serves as a bridge between the upper and lower portions of our campus.